Watch: Ambassador Friedman arrived at the site of the new embassy in Jerusalem to closely examine the preparations for its opening. 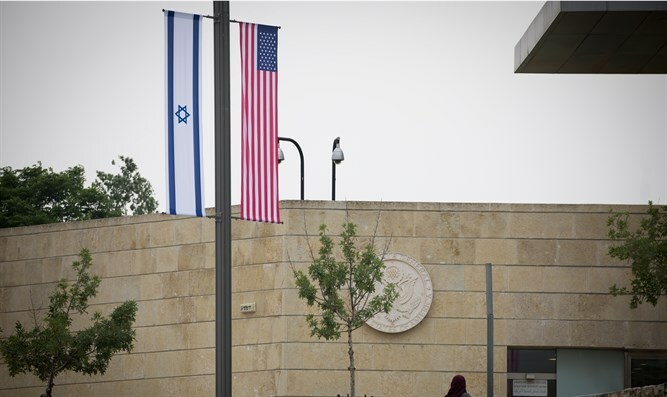 The U.S. consulate in Jerusalem is currently completing the final preparations to turn the building into the official American embassy in Israel, ahead of its inauguration on Monday. "The embassy staff is working around the clock to get ready. We’re anticipating a beautiful, inspirational, moving event. As they say in the Passover Haggadah: 'Next year in Jerusalem.' This year, thanks to the U.S. administration, the courage and the vision of President Donald Trump, we can say, 'This year in Jerusalem,'" added Friedman. Earlier on Friday, Friedman held a briefing for journalists with Victoria Coates, a member of the National Security Council, in preparation for the relocation of the embassy. Coates stated that Trump moving the American Embassy to Jerusalem serves U.S. interests and is not part of a “give-and-take” with Israel. "This is something that serves the United States. There is no give and take with Israel with regards to this decision," she said. Coates added, "There are people who are happy with the decision and people who are unhappy - but it's far too early to measure reactions. We are convinced this decision creates a platform and an opportunity to promote a peace process based on realities, not fantasies. We're sure it will create greater stability in the long run." On Thursday, Trump spoke at a rally in Indiana and received a loud round of applause from the crowd when he said, "Next week, we will finally open the American embassy in Jerusalem." Trump recalled that, after he recognized Jerusalem as Israel’s capital, he asked how long it would take to build a new building for the embassy. “So they said from five to 10 years, that means probably 15 to 20 years right? So we open the embassy next week, three months, three months,” stated Trump.